Back in 2006, director Sophie Fiennes (sister of Ralph and Joseph) made a documentary with well-known philosopher Slavoj Žižek called The Pervert's Guide To Cinema. It was essentially an illustrated lecture, with the philosopher dissecting dozens of films. Poking around Netflix a couple of years ago, I decided to give that movie a shot, but I didn't end up finishing it. I appreciated Fiennes's humorous technique of recreating the onscreen locations of the films Žižek was discussing, which provided some visual interest besides Žižek's non-stop talk. I found Žižek's rambly, wry oratory style quite engaging, but I just couldn't see where the film was going. I had trouble grasping what the insight was. Now, I feel like going back and seeing that doc again (although Netflix has purged it in the intervening time). The reason is that Fiennes and Žižek have reteamed for The Pervert's Guide To Ideology, which feels like a direct continuation of the prior film. While Žižek does make a few detours into cultural phenomena like Coca-Cola, Starbucks, and even the German band Rammstein, he mostly depends on the movies to help decode and illustrate the way that ideology works in modern society. And once again, Fiennes places Žižek into the scenes he is discussing, whether that means sticking him inside the latrine where Private Pyle ends it all in Full Metal Jacket or placing him on Travis Bickle's decrepit bed from Taxi Driver. And once again, I had trouble getting into the film. But, I realized this time, I think that difficulty is a result of my habits as a viewer and not the fault of the filmmakers. The Pervert's Guide To Ideology does not hold the audience's hands as Žižek works out a way to describe what ideology is, how it works on people, and how that manifests in culture and the movies. I found myself re-watching chunks of the film and taking notes, like I was in a college lecture. I would argue, in fact, that this might be the best way to see the film. I think this is because Fiennes's choice of film clips and the staging of her sole actor inside the settings of these clips tends to pull the brain in two directions. One direction follows what Žižek is talking about, like the observation that self-awareness does not eliminate a person from taking part in a self-destructive ideology, like consumerism. The other direction one's mind follows is the narrative tied to the movie clips; in this instance, Žižek teases out that idea about self-awareness by discussing the musical number "Gee, Officer Krupke" in West Side Story. When Fiennes chooses to drop in Žižek's voice over certain chunks of the number, like an inconsistent disc-jockey, it can be hard to reconnect with the thread of Žižek's discussion -- if only because you're invested in seeing where the clip goes next. In fact, one of my main take-aways from the film is that there are a lot of good movies I need to re-watch... which is certainly not the filmmakers' main objective. That said, the film is not dauntingly dense, and if one makes the effort to keep track of what is being discussed -- such as through re-watching sequences, like I did -- the structure of Žižek and Fiennes's overall argument becomes easier to track. This is the reason why I'd like to re-watch the first film, because I feel like it's quite possible the featured movies (ironically) were getting in the way of me appreciating what Žižek had been trying to tell me about those movies. Žižek plants his flag as an oddball but totally engaged thinker right at the beginning of this new film by demonstrating how John Carpenter's underrated alien invasion classic They Live encapsulates his broadest views on ideology. Praising the film as a "masterpiece of the Hollywood Left," Žižek not only appreciates the film's conceit of special glasses which decode all of the advertising propaganda of the capitalist system and reveal the ideology behind them, but he also pinpoints the infamous prolonged street fight between Roddy Piper and Keith David, where David continually refuses to wear the glasses which will shatter all of his illusions, as brilliantly articulating the complicity of everyday people in the maintenance of the big ideological lies they are fed constantly. He uses The Sound of Music to further develop the thought, by going into the psychoanalytical concept that there is a difference between enjoyment and simple pleasure, because often people find enjoyment in disturbed pleasure and pain. He discusses the song "Climb Ev'ry Mountain" -- a song he says was cut out by the Communist censors when he first saw the film in Yugoslavia -- and how it shows the attraction of the Catholic ideology: you can get whatever you want, as long as you maintain the appearance of suffering and renouncing sin. He discusses Beethoven's "Ode to Joy" from the Ninth Symphony, and how it has been embraced by groups with vastly different political ideologies from the Nazis to Peruvian guerrilla fighters, from pro-apartheid Rhodesians to the modern-day European Union. Ideology, Žižek posits, has to be an empty container open to all interpretations. Žižek further argues that despite the perceived message of brotherhood in the "Ode To Joy," that Beethoven was practicing a critique of ideology. After all, when a certain group joins together in brotherhood, someone else must be excluded and Beethoven's work is stating the exclusion. 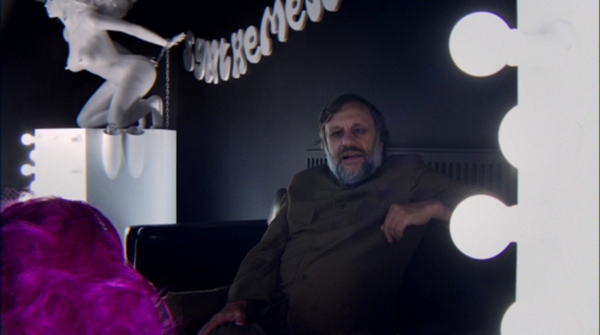 This, Žižek suggests, might explain why the character of Alex in A Clockwork Orange is shown to be so moved when he sits in a milk bar and sees a woman singing from the "Ode To Joy." Alex is on the outside and finds something relatable in the work. 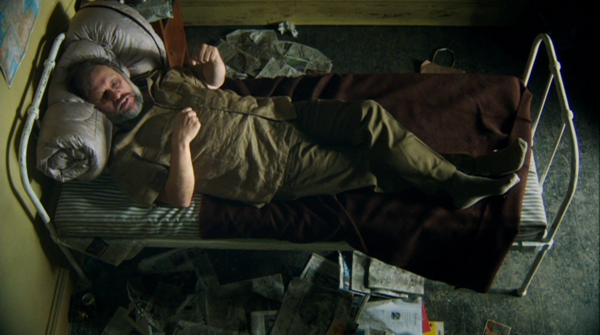 For almost two-thirds of the movie, Žižek examines from different angles the idea that fantasies are the key component of ideologies. Taxi Driver and The Searchers stand as examples of what happens when the fantasy of heroism is thwarted: there is an outburst of confused violence. He even sees allegorical connections to America's recent military interventions in countries that didn't want our help. Jaws is compared to the Anti-Semitism of the Nazis and the scapegoating of welfare mothers, because in each instance the multitudes of public fears can all be subsumed behind the fantasy of one Really Important Fear, be it a killer shark, or the encroaching racial Other, or some other marginalized demographic. He imagines that Leonardo DiCaprio and Kate Winslet's relationship most likely would have lost its spark in a few weeks if the Titanic hadn't hit that iceberg, just as 1968's Prague Spring probably would have petered out in a banal way if the Soviets hadn't cracked down and snuffed it out early: in both cases, the abruptly wrought incompleteness allows the fantasy of a better alternate life to be kept alive longer than if things had just run their course. He compares the Bush administration's lies about weapons of mass destruction to the decision in The Dark Knight to feed the public a series of lies about Batman, Harvey Dent, and the rest of Gotham City's government. Both Donald Rumsfeld and Commissioner Gordon follow the notion that order will not be maintained without a fundamental lie. The Pervert's Guide To Ideology gives the viewer a lot to chew on, but it makes its points in a very entertaining way. 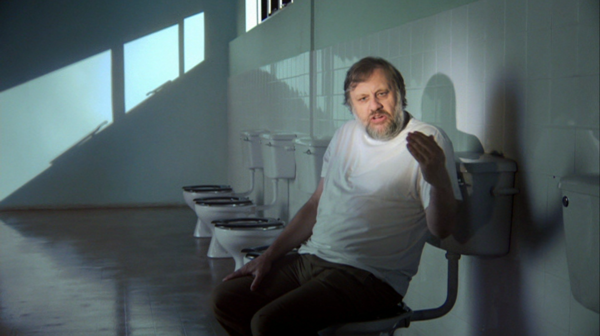 With his thick accent and sometimes halting speech, Žižek doesn't seem like a natural screen presence. But the unflagging energy and often wicked humor with which he makes his points goes a long way toward making the film a treat. His matter-of-fact description of a Coca-Cola going from cold to lukewarm as being a passage from "sublime to excremental" still makes me chuckle even as I re-type it now. While some of what he talks about might feel like common sense, Žižek shines a new light on a lot of familiar topics like religion, government, consumerism, and even love, while dodging a lot of political and dogmatic sinkholes. At one point he claims, "A pervert has no uncertainties," and that hysteria is the greater subversion because new inventions come as the result of hysterical questioning. If we take Žižek at his word, then he is a pervert whose work is creating new hysterics. The documentary is presented as 1.77:1 widescreen, although Fiennes shoots each clip of Žižek to match the aspect ratio of the film being discussed. So, for example, while the footage aping Taxi Driver fills the whole screen, the mock-Jaws footage is letterboxed to about 2.35:1 and the scenes aping classic films are pillarboxed to about 1.37:1. Overall, the quality is inconsistent: not just in the appearance of the archive film clips, but also during the new footage, which has a general softness to it. The box claims that the disc came from an HD transfer, but it looks like it very well could have been duped from a PAL submaster to NTSC. There is quite a bit of noise in the image, which can be distracting on a big 16:9 screen, but is predictably less so on a standard TV or laptop. The Dolby Digital stereo audio fares a bit better than the picture. The mix, which blends Žižek's speech with music and film clips is very clean and understandable. No noticeable distortion. There is a section where Žižek's speech has been very obviously ADRed because it sounds different from everything else, but even that doesn't sound bad, just different. The disc also offers English SDH. Q&A with director Sophie Fiennes and Slavoj Žižek (28:40) - Recorded at New York's IFC Center after a screening of the film, this is obviously just the product of someone plopping down a camcorder on a tripod and occasionally zooming to keep both of the interviewees in frame. Even though it is visually plain, this turns out to be a very enjoyable conversation mostly dominated by Žižek. The pair gently make fun of each other, giving a sense of what their working relationship might be like. They mention that the original plan was to follow up Pervert's Guide To Cinema with a film about opera, and Žižek excitedly describes some of the things he likes about opera. They discuss a few theoretical ideas and stories that were shot but did not end up in the final 135-minute film. Most entertainingly, Žižek discusses his preference for Guillermo Del Toro over his Mexican colleagues Alfonso Cuarón and Alejandro González Iñárritu. In the most "perverted" moment on the whole disc, he recounts a conversation where Iñárritu asked him what he thought about the philosophical implications of 21 Grams. Žižek claims he replied, "You think about the philosophical intention of 21 Grams, but I want to know, did you f**k Naomi Watts?" An insert with Production Notes and a Director's Statement. The Pervert's Guide To Ideology is not great for passive viewing. I bet you would be entertained that way -- the film clips are excellent and Žižek is a highly watchable individual -- but much of the documentary's cultural analysis won't make a great impact. Instead, I suggest approaching the film like an illustrated lecture and be prepared to re-watch it and take notes. There is only one major bonus feature on the disc, but it's a good one. Recommended.